A brainchild of Cranky Monkey studios, Bubble Jungle pro is an exceedingly fun and addictive game which pits the player against a milieu that is filled with foes, obstacles and tasty treats. Available for both ipad and iPhone’s, the Bubble Jungle pro is an entertaining puzzle game which will undeniably keep you, the player entertained throughout the day. Irrespective of the game’s gigantic size, the visual effects in this game are absolutely amazing. The total size of is 786 MB, 500 MB less than the previous version. One of the main characters in this game is Chuck the Chameleon, who will become your best friend as you proceed in the game. As you play through the 9 different worlds and the 58 plus levels, you will be surprised by how long and extensive the entire game is. With a total of 9 worlds and 58 levels, you can play the game for a total of 15 hours. However, through each of the level, you will be offered helpful arrow signs and hints which will guide you through the game. Apart from the numerous levels in game, there is also an auto save feature which saves each of the level as you progress through the game. Another key feature in this game is the simple controls. You will be required to simply tap and then drag your thumb towards the screen’s left side so as to move chuck across the map. There are also two more buttons located on the screen’s right side. One of the buttons is for shooting while the other button is for jumping. You can also use the bubbles to subdue enemies or destroy the boxes for goodies. In the game, you are going to have a limited number of bubbles, thus be sure to conserve these bubbles so that you can use them when you are really in need of them. Apart from the pro version, there is also a free version of the game which unlike the full version it has a few limitations and also it is not as great as the original version. The free version is full of advertisements which in turn make the scree a little bit crowded. With that said, Bubble Jungle Pro allows the user to customize the main Chuck with accessories. Additionally, the game allows the user to play with a maximum of three other players online. Thus, instead of downloading the free version, be sure to purchase the pro version of the game, for an ideal gaming experience. Since this is the pro version of this game, it is available on Apple store at 1.99USD only. Looking at the content, the number of levels and the game’s graphical interface, the pricing for this game of only 1.99 US dollars, thus giving the users a value for their money. Bubble Jungle pro requires iOS 8.0 or later. 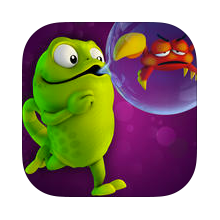 If you are looking for a game that is not only reasonably priced but will also offer you, the player a value for your money, then purchase the Bubble Jungle Pro on Apple app store for only 1.99 US Dollars.